Metro's proposed budget calls for service cuts will save money on salaries but spending on contractors would increase. The numbers come from documents prepared for a budget work session set for Thursday. WASHINGTON — Metro expects reductions in train and bus service would save $24.5 million in salaries and benefits next year, but more than half of those savings would be offset by an increase in spending on contractors. Metro documents call to spend $64.6 million on contractors in the fiscal year beginning in July. That’s $17.2 million more than the budget for the current fiscal year, and more than 2.5 times the $24.8 million Metro spent on contractors three years ago. Metro justifies the contractor spending saying it is is needed to support maintenance work, meeting federal safety requirements and the costs of running new facilities such as the Silver Spring Transit Center and the Cinder Bed Road Bus Facility. Metro does not include contractor costs in its total personnel costs. In the last year, the transit agency has hired contractors to do everything from top-level management consulting to basic track work and inspections. The documents were prepared for the second of three Metro Board budget work sessions, set for Thursday. The session will focus on labor costs. A meeting later this month will focus on nonlabor costs. The first work session, held last month, focused on ridership and revenue. 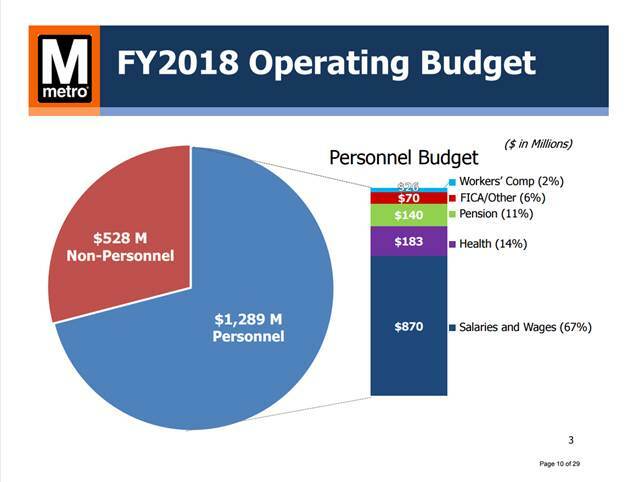 Metro had 13,032 internal positions approved in the current fiscal year’s budget; General Manager Paul Wiedefeld’s budget proposal for the coming year would only authorize 12,032 positions. While many of the positions Metro trumpeted cutting in 2016 were already vacant, Metro expects the majority of the staff cuts proposed by Wiedefeld would involve positions that are currently filled. A public hearing on the entire budget proposal is expected the week of Jan. 30. The Metro Board is scheduled to adopt the budget, including any fare hikes and service cuts, in March. A proposal to run fewer trains all day long, in addition to the already approved shorter service day, would lead to the loss of 116 train operators, mechanics, supervisors and other staff positions. Proposed cuts to bus service would lead to 184 positions being cut. Metro would save additional money by using less fuel and power and lowering other costs, but Metro has acknowledged the cuts and proposed fare hikes could drive even more riders away. Wiedefeld has also proposed asking for more money from the governments of D.C., Maryland and Virginia after contributions were held flat in the last cycle. If the board would reject any of the cuts or the local government subsidy increase, Metro hints in a response to the board that it could come up with a plan to cut $10 million more in spending that could be equally unpalatable. “This would require the elimination of an additional 150 positions in FY2018. This can be accomplished with service reductions and/or elimination of other business functions,” the response says. Despite ongoing contract negotiations with Metro’s largest union, the budget does not account for any potential raises for Metro workers. A 3 percent salary increase, when accounting for payroll taxes and pension increases, would cost about $30 million in the first year. 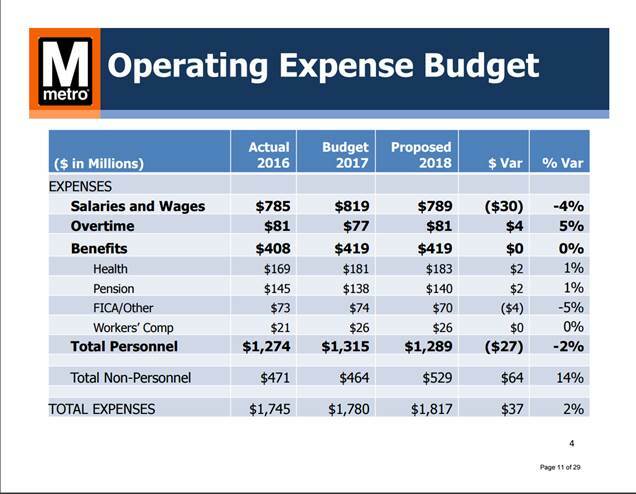 Metro’s proposed short-term operating budget totals $1.8 billion for the year starting in July, with $1.29 billion designated for personnel costs and $529 million for other costs. That would be a $27 million decrease in labor costs from the current fiscal year’s budget, and only a slight increase over the previous year. Non-personnel costs would rise by $64 million. The proposed budget estimates that workers would make a combined $81 million in overtime in the year beginning July 1, the same as two years earlier. In addition to the debate over the short-term budgets, Metro also faces steep capital spending needs and $2.8 billion in unfunded pension and other post-employment benefits liabilities. Metro plans to contribute $129 million in operating money and $22 million in capital money to its defined benefit pension plans in the coming fiscal year and $60 million in operating money toward medical, pharmacy and life insurance coverage for retirees. Metro has limited the type and number of new employees who qualify for the benefits in recent years. Now, only Transit Police are eligible for the other post-employment benefits while new nonunion and some other workers are no longer eligible for the defined benefit pension plans.